MONTREAL, Jan. 17, 2019 /CNW/ - Following the world premiere at the Los Angeles auto show in November 2018, the all-new Mazda3 and Mazda3 Sport made their Canadian debut at the 2019 Montréal International Auto Show today in front of Canadian automotive media. With a starting MSRP of $18,000, the all-new Mazda3 ushers in a new era for Mazda with refined Kodo design, Skyactiv-Vehicle Architecture based on human-centric development, and the latest Skyactiv engines which allow intuitive control of vehicle speed in any situation. The all-new Mazda3 adopts a matured Kodo design language that embodies the essence of traditional Japanese aesthetics. While the overall form presents a simple, single motion, subtle undulations bring the design to life through shifting light and reflections that glide over the body surface. 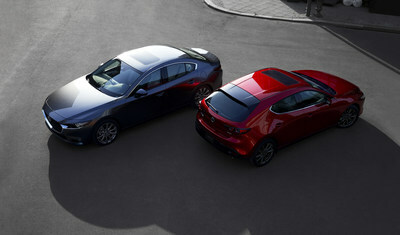 In designing the hatchback and sedan versions of the new Mazda3, the development team took a fresh look at their respective values and personalities and then worked to maximize the unique appeal of each. The hatchback presents a powerful and seductive look with lasting visual appeal that evokes a sense of exciting experiences to come. In contrast, the clean, sleek and sophisticated beauty of the sedan speaks of maturity and refinement. The result is two body types with personalities so distinct one might even think they were completely different models. The 2019 Mazda3 and Mazda3 Sport will be available in three trim levels: GX, GS, and GT. Beginning with the Mazda3 GX at $18,000, customers will be treated to standard features not often seen in this class, such as a digital center gauge display with 7-inch LCD screen, 8-speaker sound system, 8.8-inch Mazda Connect screen with HMI Commander, Apple CarPlay™ and Android Auto™ connectivity, and LED headlights and tail lights. A GX Convenience Package will be available for $2,300 which adds 16" alloy wheels, Advanced Blind Spot Monitoring (ABSM), Rear Cross Traffic Alert (RCTA), air conditioning, heated front seats, cruise control with steering wheel mounted controls, and body coloured power exterior mirrors with integrated turn signal indicators. The Mazda3 Sport GX starting MSRP is $21,300 and includes all equipment from the Mazda3 GX with Convenience Package. Both sedan and hatchback start with a 2.0L Skyactiv-G engine mated to a 6-speed Skyactiv-MT manual transmission as standard equipment. A Skyactiv-Drive 6-speed automatic transmission with manual-shift mode and Drive Selection switch is available for an additional $1,300. In the mid-trim Mazda3 GS, MSRP begins at $22,700 and starts off where the 2.0L GX with Convenience Package and manual transmission ends, adding dual-zone automatic climate controls, heated and leather-wrapped steering wheel, leather-wrapped shift knob, rain-sensing wipers, automatic on/off headlights, and i-ACTIVSENSE safety technologies. Mazda's i-ACTIVSENSE suite of safety technology includes Mazda Radar Cruise Control with Stop & Go function, Advanced Smart City Brake Support with Pedestrian Detection, high-speed Smart Brake Support, Lane-keep Assist System, Lane Departure Warning System, High Beam Control System, Forward Obstruction Warning, and Distance Recognition Support System. Options for the Mazda3 GS include the 2.5 litre Skyactiv-G engine with 6-speed automatic transmission, a new version of Mazda's predictive i-ACTIV AWD system, and a Luxury Package. The Luxury Package includes leatherette-trimmed upholstery, 10-way power-adjustable driver's seat, driver's seat memory function, power glass moonroof, and auto-dimming rearview mirror. Mazda's evolved i-Activ AWD newly adds "four-wheel vertical load" detection and works in harmony with G-Vectoring Control Plus (GVC Plus) to control torque distribution between the front and rear wheels. As a result, it is fully capable of responding faithfully to the driver's intentions, regardless of the driving scene. It also reduces overall mechanical loss by approximately 60% over the previous model and contributes to improved fuel economy. When equipped with AWD, the Skyactiv-G 2.5L also includes Cylinder Deactivation. The Mazda3 Sport GS starts at $24,000 and features the 2.5 litre Skyactiv-G with Cylinder Deactivation as standard equipment, still paired with the 6-speed manual transmission. The Luxury Package is also available with the manual or automatic transmission, while i-ACTIV AWD is only available with the 6-speed automatic. As with the outgoing model, the top trim is the Mazda3 GT, which starts at $26,200. In the sedan, the 2.5L Skyactiv-G engine and 6-speed automatic are standard equipment, along with all equipment from the GS Luxury Package. The Mazda3 GT also adds paddle shifters on the steering wheel, 18-inch alloy wheels, automatic levelling headlights, signature lighting on front and rear lights, Adaptive Front-lighting System (AFS), and Bose® premium audio with 12-speakers. Options for the GT model include i-ACTIV AWD, and a Premium Package. The Premium Package includes leather-trimmed upholstery, 10-way power adjustable driver seat with 2 position memory function, rear parking sensors, Smart Brake Support Rear (SBS-R), Smart Brake Support Rear Crossing (SBS-RC), advanced keyless entry (proximity and ignition), navigation with voice command, windshield-projected colour Active Driving Display (ADD), SiriusXM® Satellite Radio, SiriusXM Traffic Plus and Travel Link® services (complimentary 5-year trial subscription), and more. The Mazda3 Sport GT is made for drivers, with a choice of 6-speed automatic or optional manual transmission mated to the 2.5L Skyactiv-G engine producing 186 horsepower and 186 lb-ft of torque. The Premium Package is included for the manual model. All-wheel drive is available paired only with the Skyactiv-Drive 6-speed automatic transmission. The all-new 2019 Mazda3 will be available at Canadian Mazda dealers in the first quarter 2019.